Much like the S-Class sedan is the pinnacle of Mercedes’ sedan range, the GLS is the premier SUV in the Benz line-up. 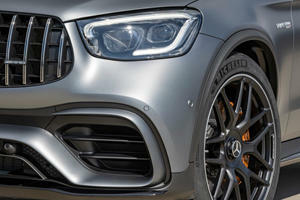 A majority of buyers will stay put with the base 3.0-liter six-cylinder engine, whilst those with higher budgets and cravings for more power can upgrade to a 4.7-liter or 5.5-liter eight-cylinder setup. Cargo space is on the limited side for this class, but the Mercedes-Benz GLS compensates with a vast and beautifully-made cabin. As with a majority of cars in this class, usability and comfort take top priority, but the Mercedes-Benz GLS truly excels in this area. 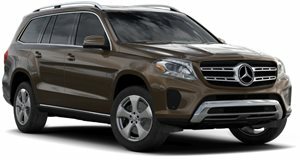 Mercedes-Benz has a premier reputation for building rather impressive luxury cars, so it’s unsurprising that the GLS-Class stands firm as a rather enjoyable high-end SUV. Despite being one of the older cars in this class, the GLS still holds its own in terms of comfort, refinement, cabin space and build quality, as well as throwing in attributes such as low-speed manoeuvrability into the already encouraging mix. 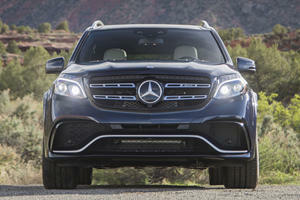 Though admittedly not the only vehicle in this class that can successfully juggle these attributes, the proficiency of the Mercedes-Benz GLS’ execution makes it a car that prospective luxury SUV buyers should definitely shortlist. Bar the absence of standard-fit leather upholstery, there’s very little that disappoints about the Mercedes-Benz GLS’ cabin quality-wise. High-grade plastics are available on all models, with really plush examples gaining diamond-quilted leather and wood grain trim pieces, and fit-and-finish levels are amongst the highest in this segment. The car’s boxy proportions also result in impressive amounts of interior space, with all seven seats boasting enough head, shoulder and leg room for adults to feel comfortable in (a trait not all seven-seater SUVs in this class share with the Mercedes). Alas, trunk room is rather tight with all seats in place at just 16 cubic feet, but the opening is at least big and the trunk floor is flat throughout. Folding the two rear seats down does also increase cargo capacity to 49.4 cubic feet. Being a large, luxurious SUV, the Mercedes-Benz GLS ticks all the boxes when it comes to comfort. A combination of impressive noise insulation and a rather cossetting ride make the GLS a thoroughly enjoyable car to spend time in on longer journeys. The large windows are also welcome – especially in built-up areas, where a sizeable glasshouse makes navigating narrower roads a less frustrating ordeal in such a big vehicle. That said, chunky pillars all-round do generate some sizeable blind spots, though this isn’t uncommon in the luxury SUV class. Going back to manoeuvrability, the light and direct controls further assist the GLS in navigating tighter spots. For a majority of Mercedes-Benz GLS buyers, the 3.0-liter six-cylinder gasoline engine will be more than enough for their needs. Outputs of 362-hp and 369 lb-ft of torque are more than enough to propel the SUV along at sufficient speed, and the engine is more than happy to settle at cruising speeds – suiting the car’s more comfort-oriented demeanour. It’s relatively frugal by class standards too, with claimed economy of 17mpg city/22mpg highway. Those after more power can opt for 4.7-liter or 5.5-liter eight-cylinder gasoline power – but these engines are far pricier to buy and run. All models bar the 5.5 get an excellent nine-speed automatic; the largest engine only available with a still-impressive seven-speed auto. Unlike some offerings in this segment, the Mercedes-Benz GLS comes with a decent array of features as standard bar the aforementioned lack of leather. All versions come with cruise control, heated front seats, a reversing camera and autonomous emergency braking, though ventilated front seats and navigation are only available as standard on versions with eight-cylinder engines under the hood. The Mercedes-Benz GLS impresses when it comes to safety gear: cross wind stability and driver drowsiness monitoring assists come as standard, with blind spot monitoring and active cruise control available as options. 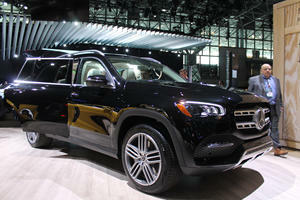 No crash test results have been published for the Mercedes-Benz GLS at time of writing, however. Though it’s far from being the only comprehensibly well-rounded luxury SUV on the market, the Mercedes-Benz GLS remains a thoroughly-impressive all-rounder. If you’re considering a vehicle like this as your next new car, the Mercedes-Benz GLS should be right up there at the top of your shortlist. Mercedes wants the new GLS to be the S-Class of SUVs.